The news wasn’t good yesterday at the Vet. My girl’s been diagnosed with lymphoma, with a fast growing tumor which has wrapped itself around her intestines. At 2 months shy of her 17th birthday, and according to the vet, 4 years past average life expectancy, with losing 3 lbs already since December, the news is just not good. But being me, I bend my head in gratitude for all of the blessings both big and small and the coincidences which albeit tiny matter magnificently https://misifusa.wordpress.com/2013/03/18/lion-roars-a-confession/ for when I called the vet yesterday, I was able to get my favorite vet who has known Chessie for 17 years. I wept unabashedly in the examination room as the doctor gave me the news. She spent almost an hour with me, going over options, scenarios and examining Chessie quite thoroughly. I think what I love most about our vet is her compassion and the way in which she treats our pets. She tenderly spoke to Chessie, lifting her a gentleness for which I was grateful. She even talks to her as if they are speaking ~ she’s always done it ~ and yesterday I ventured to ask if she had the gift of hearing Chessie speak, but she skirted the issue. Perhaps she didn’t want to tell that she could understand her because quite frankly, I’ve always thought there was something extraordinary about our vet. She just seems to know about our pets. When she delivered the news, she unceremoniously held Chessie’s ears as if she didn’t want her to hear what we were talking about so that it wouldn’t color the patient’s outlook on life. It was done unconsciously I think ~ and as she explained her diagnosis, the possibility of treatment which would include chemo etc. and how she personally felt about the whole thing, she continued to pet Chessie and keep her happy. I sat across from her, afraid to get up for fear I would faint away. So instead, I wept in my chair, dabbing my face with tissues as I tried to imagine how I would tell the boys and my husband what she was saying. I spent most of yesterday crying for both of us. In fact, tears come unbidden when I am not attentive to my thoughts or when I let them stray. So in the meantime, Chessie and I continue to bond with her staying by my side as I write this morning. We have yet to tell our sons, but because Chessie is not in pain (which matters magnificently), we have some time. I think we’ll have the talk tonight with them and plan for Friday so that we can all still have some time to spend with her. 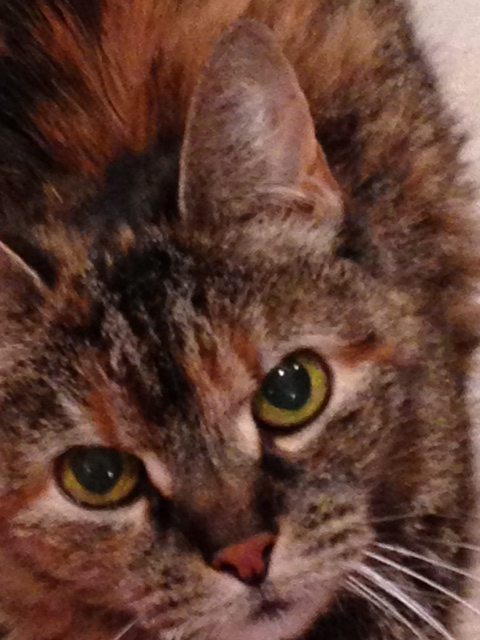 For we are blessed to have had her for almost 17 years, she has given to us more than we have given to her as a stray. She has filled our hearts and our days with laughter at her antics, to healing with her purring, to love with her affection. She has been a part of our family for almost as long as we have been married. It’s going to be a difficult time for all of us ~ especially for my hubby and me because she’s our first ~ and because she’s been like our little guardian angel ~ ok, she’s been my ever present guardian angel. And I know, she’ll still be with me when she crosses over because our bond is so strong, but it just won’t be the same. I look for her everyday and every night and all the time in between. I don’t want her to suffer as she is weakening quickly. I want to hold her as she passes so that I can be with her just like she’s been with me for so many years. I’ve told you how she never left my side throughout my breast cancer journey. Even through last year’s 4 surgeries, she stayed by my side, always purring me into healing in fact, she’s been there for me for all 14 surgeries. Right now, she’s snuggled on a blanket next to me, eyes 1/2 open, breathing rhythmically, just resting. Every few minutes, I reach over to snuggle with her, burying my tear-stained face in her fur. I know she knows ~ and as always, she’s being strong for me ~ I am just so grateful for her being ~ God Bless my little kitty. Instead it is I, who bends her lioness head in gratitude for all of the blessings both big and small and the coincidences which albeit tiny, matter magnificently. October 29 is National Cat Day!. Thanks Russel for sharing this special day with us! 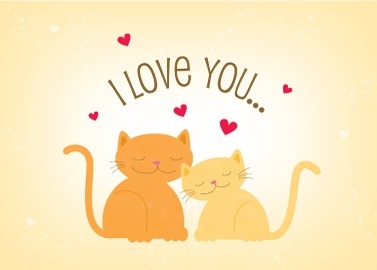 I saw this card and it reminded me of our Tabby/Mainecoon mixed cat Chessie ~ aka Francesca Maria…who, in her infinite wisdom and love, never left my side while I was in bed since I was diagnosed. 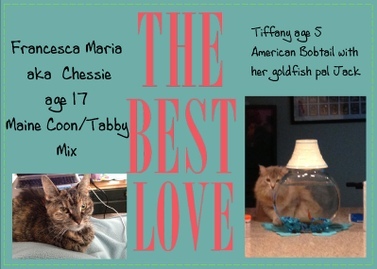 Chessie became my constant companion and was always ready to snuggle on the bed with me when I was there. To this day, she will still lay on top of my legs or snuggled on my side and her deep throaty purr reverberates against my body and I can feel the vibration of love that she sends straight to my soul which she emits with her constant purr. I realize that the dog lovers are not believing this situation (and I love dogs as well) ~ but I will tell you that I think she helped to cure me with her constant companionship. 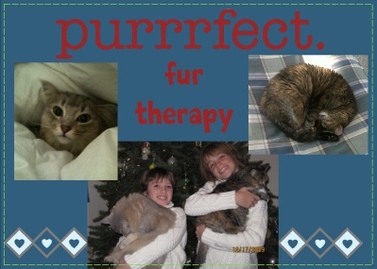 We coined the phrase ~ FUR THERAPY ~ in our home from this phenomenon and now with the addition of our other cat Tiffany (an American Bobtail) who is even more affectionate (and verbal), we are all enjoying our animal connections. and reminding me to PURR loudly!